Advantages: Stunning printing in a tiny size; large number of transfers for up to 40 figures; eliminates a difficult figure painting task; authentic and "in-scale"; dry-transfers leave no carrier film; simple and precise to apply. I just received the new release from Archer Fine Transfers of the German SS Uniform Patches and thought I would share my thoughts and review. First, I have to say that it is truly disappointing when one spends enormous amounts of time painting a figure and having great success only to end up messing it up with a badly painted, blotched and oversized insignia on a uniform. Insignia and patches which are ready-molded on a figure are usually oversized or undersized and most times inaccurate with very little definition and detail. It makes the task even tougher when there are no patches molded on to work with. Either way, painting well done uniform patches and insignia is probably the toughest task there is to painting figures. Archer Fine Transfers to the rescue! 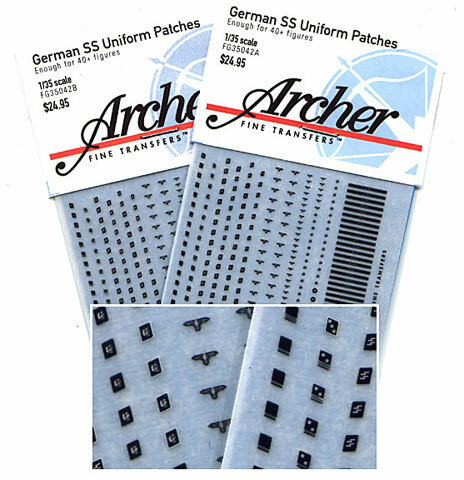 Archer has just released a dry transfer set - German SS Uniform Patches (FG35042A). The German SS Uniforms Patches are offered in two color combinations in two separate sets: either white with white piping (FG35042B) and gray with white piping (FG35042A).The gray with white piping (FG35024A) is a more accurate color combination of the two sets as it is closest to the actual thread color and shows a distinction between it and the white piping. The German SS Uniforms Patches set provides enough transfers to outfit 40 or so figures. The sheet provides five each of Schütze up to and including Unterscharführer, three each of a Oberscharführer, two each Hauptscharführer up to and including Obersturmführer, one of a each Sturmbannführer up to a Oberfüher. I examined the set under a microscope and the patches are absolutely stunning. I have never seen anything so well printed in such small size. The grey boundaries around the collar patches are exact, no overprints or overlaps and crisply reproduced. Even on the the sleeve eagle emblem "Hoheitsabzeichen"- worn by the SS -VT/Waffen SS - is so very finely done and printed that the swaztika emblem under the eagle is reproduced to the highest detail. No paint brush could ever achieve such precision. Another example of how well these are printed is the leaf on the SS-Standardtenfurher. One can see a dark "leaf vein" running through the middle of it like the real thing. The collar patches are all finely reproduced - i.e the SS Hauptsturmfurher patch has two very fine liness and a diamond - beautifully printed and void of any glitches. Also included in the set are single chevrons (to be worn with SS- Sturmmann two lines through collar patch) and double chevrons. To add to this, Archer included in same set cap Eagles and Death Head plus 40 Cuffs with finely printed titles for "Adolf Hitler" ( 1ss Pz Division Leibstandarte), "Wiking" (5th Pz Grenadiers), Deutchland (1st SS Regiment), Der Fuhrer (3rd SS Regiment), Germania , Totenkopf (3rd SS PZ Division officer’s cuff title post 43), and Das Reich (2nd SS Pz Division). The application was a cinch. After sanding down the molded on collar on a resin figure, I cut out a collar patch with an Xacto knife, placed a thin piece of scotchtape on top, layed it down on the collar in position with tape to secure it in place and pushed a pencil gently onto the tape which made the transfer adhere to the collar. The whole operation from cutting patch out to rubbing it off onto the collar took a minute. To ensure the patch stayed down, I applied a dab of dull cote to act as a secondary "glue". And what a difference a nicely printed patch will make ! With no decal carrier to boot !! Easy to use, exquisitely printed and reproduced, accurate in size, loads of choices, and enough for a slew of figures. And the price of the set ($24.95) works out to about .60 cents per figure - small price to pay to make a figure stand out. This is the only way for me to go in future. These are absolutely brilliant and a true blessing to any figure painter.